It’s not very often J and I get a night where neither of us has to work or has to sleep. When one of those rare nights do pop up, I don’t think we know what to do anymore. I called J and told her I’d be home earlier than expected and we started making plans. Should we go out? Should we order in? We both *wanted* to go out, but neither of us were in the mood. In the end, we decided on pizza and a movie….at home. Before I left work, I walked out to the mailbox to see if our mail carrier had made his deposit yet. He hadn’t, but there was a menu in the box from Roma’s Pizza. 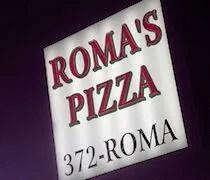 We had never tried Roma’s, so I told J to order a pizza and I’d pick it up on my way home. 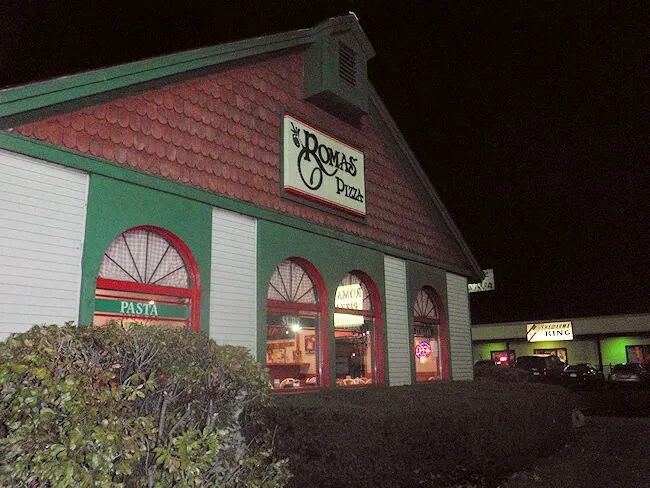 Roma’s Pizza is on Drake Road near the intersection of KL Avenue. The building isn’t really big and looks like it may have been some sort of national chain in a previous life. Since we called in the order, I didn’t even have to go in to pick it up so I don’t even know how much of a dining room there is. Roma’s has a drive-thru pick-up window so I made my way around the building to find a very narrow access road that leads to the pick up spot. 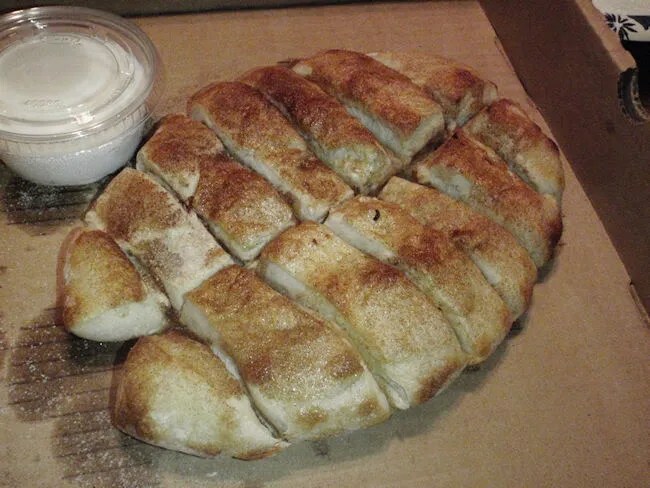 J had called in an order for a large pizza with pepperoni on half and an order of cinnamon sticks. That’s a pretty typical order for us when we order pizza. The total was a little over $18 which I paid then headed home. I must have timed it pretty accurately because the pizza and cinnamon sticks were still pretty warm by the time I got home. I was really hungry having only eaten a roast beef sandwich all day, so I grabbed a slice very quickly before J even knew what was happening. 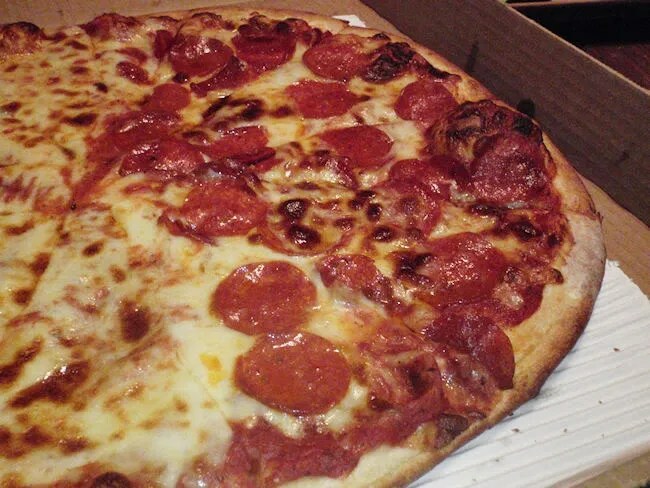 The dough at Roma’s is made in house daily and it’s cooked to a nice crispy golden brown. Both J and I noticed immediately that the crunch went all the way to the middle of the pizza which seems to be pretty rare. The crust stood almost straight when held up by the handle end. The cheese was also cooked to a light golden brown almost to the point of well done which is how J and I prefer our pizza. I went though my half in almost no time. J ate only a couple pieces and saved the rest for a future meal which I ended up stealing a couple days later. The cinnamon sticks were pretty common. I thought they may have been a little under done as they were pretty chewy and even hard to pull apart, but does that really matter when cinnamon and frosting are involved? Again, we ate about half and threw the rest in the fridge for later. Roma’s Pizza was a little bit of a surprise to us. We’re usually thin crust people and this crust is a little bit thicker than we’d normally prefer, but it was cooked really well and I know I didn’t notice that it was a little bit thicker because it wasn’t doughy. I wouldn’t be surprised if we order from Roma’s more often. It’s one of the better pizzas I’ve found in town just due to the fact the crust is cooked all the way to the middle.